Will Smart Cities Make Life Easier For Everyone? The Internet of Things has the power to make cities inﬁnitely friendlier for seniors and people with disabilities. 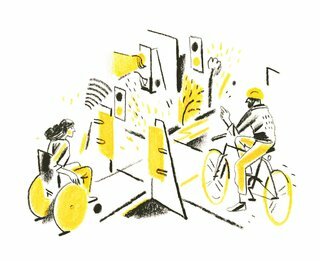 Alerts to nearby attractions you might enjoy; crosswalks that appear as needed; directions to the fastest way home during a big public event: If the first generation of smart cities focused on infrastructure, the next-generation smart city aims to leverage individual users’ feedback to create more livable communities. Think of your likes, location, and browsing history affecting not just your smartphone apps, but the world around you. Architect Carlo Ratti, who directs MIT’s Senseable Cities Lab, says that applying digital technology to the built environment enables a city to respond to its citizens: "We can imagine a city that adapts to human need, rather than the other way around—a living, tailored space that is molded to its inhabitants’ needs, characters, and desires." But taking the technology that makes our phones and homes smart and deploying it in an urban setting comes with challenges. "Technology can either include or exclude large numbers of people," says Dr. Victor Santiago Pineda, president of World Enabled and an expert on disability rights, policy, and planning. Pineda and James Thurston, vice president of G3ict, teamed up to launch the Smart Cities for All initiative to help cities around the world become more inclusive. "Nobody sets out to design an inaccessible city," Pineda says. "It’s just that they don’t necessarily know how to design an accessible one." Responsive Street Furniture offers a glimpse of what’s possible. A collaboration between Ross Atkin Associates and landscaping manufacturer Marshalls, both based in England, the idea is to enable people to customize the urban environment according to need. As people move through the city, transmissions from their smartphones or key fobs are picked up by sensors, prompting streetlights to brighten, benches to lower, small speakers to provide orientation. Another British firm, Umbrellium, has created Starling Crossing, a prototype for a smart crosswalk. Cameras track traffic conditions and send data to LEDs on the street surface, which light up and change pattern accordingly, from stop markings for vehicles and bicycles to pedestrian crossings of varying patterns, layouts, and sizes, depending on the conditions. Then there’s Neatebox’s Button, a free app that’s currently available in Scotland that enables a user’s smart device to automatically activate pedestrian crossings, giving hands-free control to those with reduced mobility or vision loss. With the world’s urban populations projected to increase at least 60 percent by 2050, there is a pressing need for cities that are as accessible as they are intelligent. "A lot of people think technology is the same thing as a solution," says World Enabled’s Pineda, "but it’s just a tool for a better social outcome." • Forecasters see huge spending on smart cities coming. Grand View Research says the market will hit $2.57 trillion by 2025; Persistence Market Research says $3.48 trillion by 2026. • And a 2016 U.N. report found that when urban infrastructure and services are designed and built following universal design principles, they bear zero to 1% additional cost.